Shalom and sorry for being so quiet lately. Hope you had a lovely Passover! We’ve had a crazy couple of weeks in our house that included saying a sudden goodbye to our beloved dog, Smokey Bear. So, amidst all of that, I just haven’t felt all that crafty or articulate enough to write about some of the projects I’ve been waiting to share. But, a year ago today is when I welcomed you with my very first Made by Mamaleh post so I couldn’t let today pass without a little crafty goodness. I mentioned a while back that we were re-doing my craft room/our guest room. The major stuff is done but it’s still a bit chaotic as I finish organizing so the full reveal of its awesomeness is still on hold until I get things all neat and tidy. For now though I want to share with you a little project I did to welcome you to my room. Now, I don’t know about you but when I go to a Jewish home, one of the first things I notice on the door is the mezuzah. It can be the first hint of the owner’s style and each room can have its own. Our front door has this lovely simple house mezuzah by Emily Rosenfeld while our bedroom has this much more stylized Gary Rosenthal heart mezuzah containing shards of the glass we broke at our wedding. I knew that the mezuzah for my craft room needed to be made by me and reflect some of the designs present in the room itself. I started with a plain unfinished wood mezuzah from Benny’s Educational Toy’s. Next, I painted it white using acrylic paint. 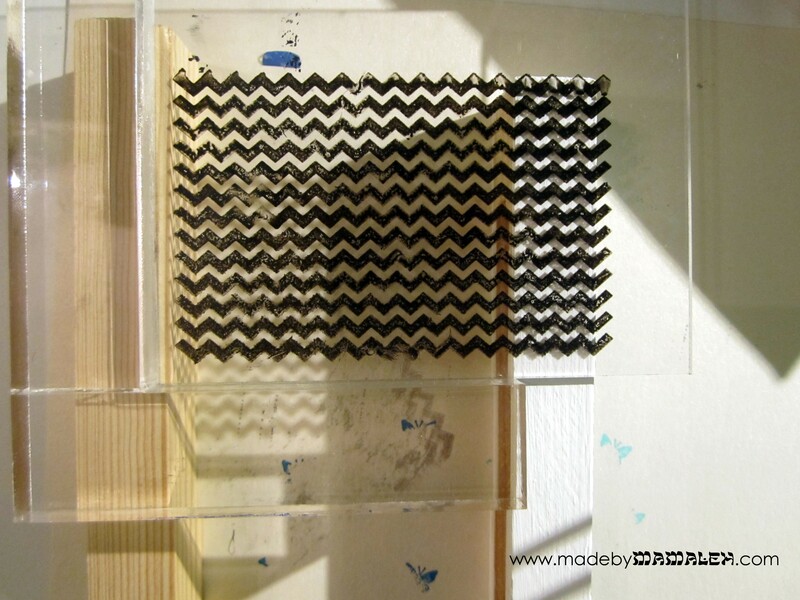 Now comes the fun part… taking a cue from a black and white chevron rug in the room, I decided to stamp a chevron pattern on top using my chevron pattern stamp from Savvy. 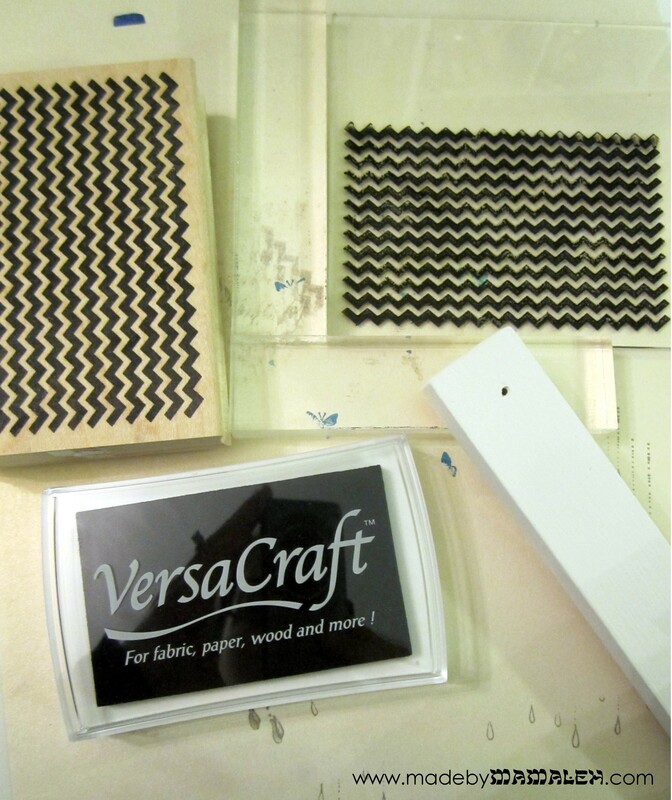 Two things are key to stamping a project like this: 1) using a stamp positioner to line up the sides and 2) using the right ink to stamp on wood – I opted for VersaCraft Real Black which is designed for stamping on wood, fabric, etc. Balancing the stamp positioner on the sides of the mezuzah proved a little tricky so I pulled out an extra unfinished one to use for balance since it was the same height. Overall, I got the chevrons lined up almost perfect although it is certainly clear this is handmade which I think is part of the charm, personally. Once I had all the chevrons stamped and they were dry, I gave them a nice coat of clear spray varnish just to help seal it all. Then it was time for the shin. I wanted to make sure I had a little sparkle to compliment the black and white so I turned to my to my Heapin’ Teaspoon O’ Swarovski Flatbacks Rainbow Pack for a nice random assortment of colors/sizes and laid them out until I was satisfied with the shape/color arrangement. 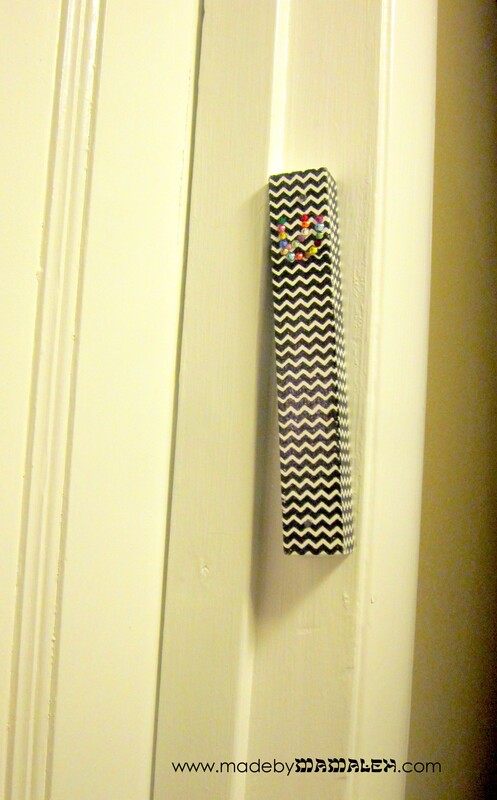 Next, using a toothpick and some E6000 glue, I carefully applied the crystals to the mezuzah and there you have it, my super custom, crafty and mod mezuzah! And, I was thrilled to find that I could even order a mezuzah scroll on Amazon and have it here in two days with Prime – score! What do you think? Want one? 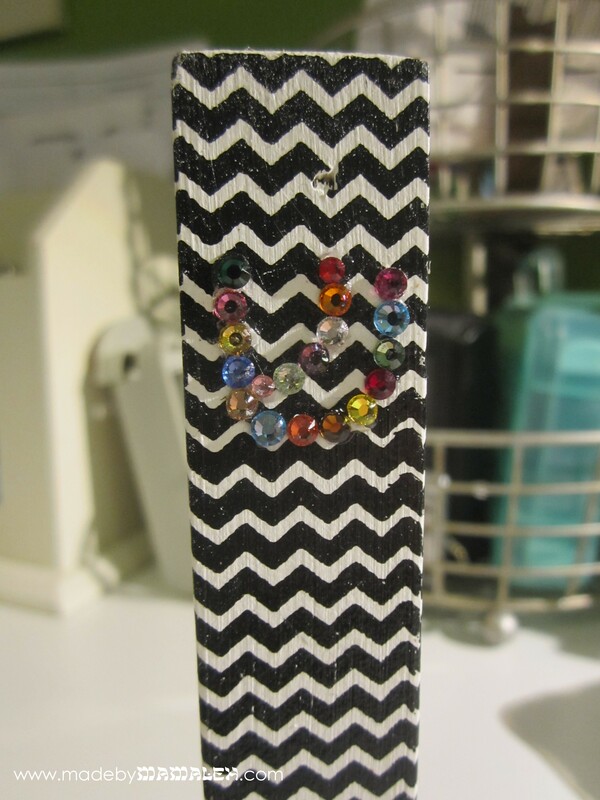 For those of you who have read through to the end, a very special blogoversary treat – one lucky reader will win their very own Made by Mamaleh chevron and Swarovski crystal mezuzah (scroll not included) just like the one I made myself. All you have to do to win is leave me a comment AND be either a Facebook follower or subscribed to the blog (just let me know which you are). Comments must be posted by Saturday, April 13th at 11:59pm PST. I am only able to ship within the USA. I’m hoping to maybe have a few more celebratory giveaways in the next few weeks in honor of my blogoversary so stay tuned and please, share with your friends! This entry was posted in Crafts, Decor, Giveaway, Rubber Stamps and tagged giveaway, jewish crafts, jewish decor, mezuzah, rubber stamps. Bookmark the permalink. Love this project! You know me…and I’m a FB follower. =) So so sorry to hear about Smokey! Congrats on making it a whole year! Love following your posts on Facebook. Happy Blogoversary to you! I am already subscribed and I also won the Matza onesie for my grandson who looked adorable in it on Pesach. 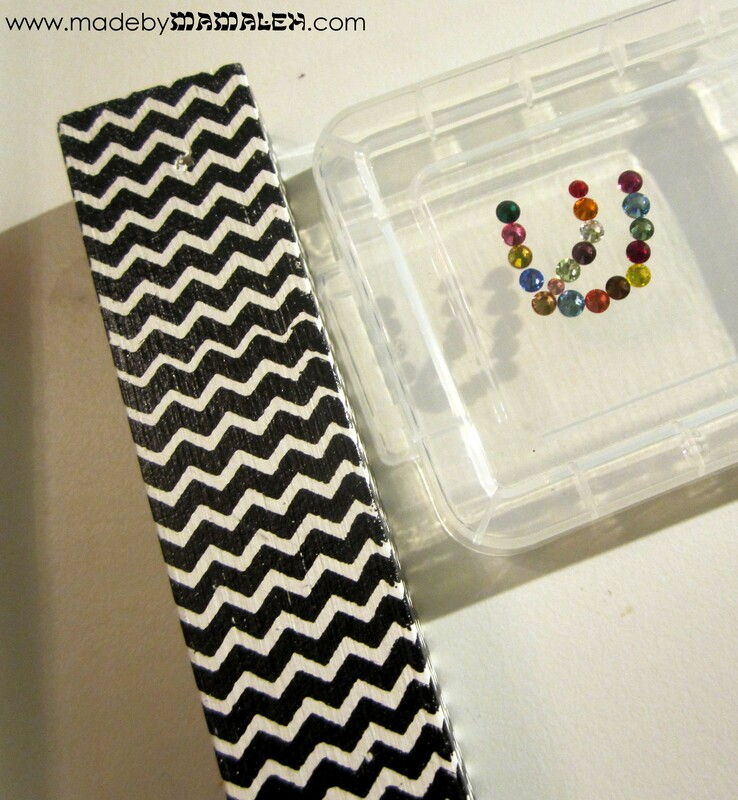 The mezuzah is really pretty and right up my alley – black and white with some colorful sparkle. Good Job. I love the mezuzah! It’s such a great way to infuse beliefs and crafts- FANTASTIC! Can’t wait to see how the craft room turns out! I am subscriber via the blog, Facebook and Twitter. Keep up the crafting!!! So sorry to hear about your dog. But Happy Blogaversary! I’m looking forward to the craft room reveal!